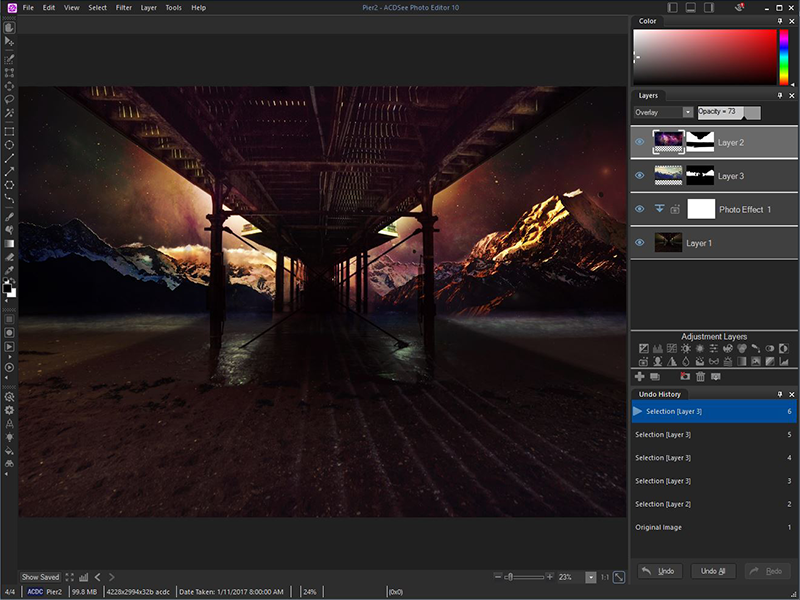 ACDSee Photo Editor 10 boasts the 64-bit power to actualize the original graphics, polished photography, and compelling art imagery you\'ve been envisioning. Total Photography ControlCut straight to the creative part with this dedicated image adjustment and layered editing software. ACDSee Photo Editor 10 boasts the 64-bit power to actualize the original graphics, polished photography, and compelling art imagery you\'ve been envisioning. Enhance photos with pixel-based editing tools, precision targeting, hundreds of filters and adjustments, drawing elements, and much more.Built-In RAW SupportTake control of your RAW images by removing noise, sharpening, balancing shadows and highlights, targeting colors, and by using a wide variety of other repair, geometry, exposure, color, and detail-oriented improvements. Then save as an ACDC file, which preserves your layers and allows for future non-destructive adjustments. ACDSee Photo Editor 10 supports the RAW editing of over 500 camera models.Clear&Concise ControlThe Dehaze adjustment layer will remove dust, smoke, vapor, or other particles affecting clarity, and restore detail, contrast, and lost color. By using layer masks to control layers\' transparency, you can hide and reveal mist in choice locations, reclaim focus for the subject, and direct the eye.Layered Retouching&RepairNo foundation, no concealer, no reshoots. You can non-destructively smooth away blemishes and flaws without strenuous, targeted color corrections or blending. Use the Repair tool to copy pixels from flawless areas and blend them into flawed ones for a natural restoration. Combine the Repair tool with a Skin Tune adjustment layer to even tone and restore glow.Selection SimplifiedMake precision adjustments by targeting specific parts of your image with the Selection Brush. Detect edges by selecting based on color, brightness, or a combination of both. Create a mask from your selection. Add lighting, color, detail, or effects-style adjustment layers to your selection. Invert the selection and impact the rest of the image with a different edit. Red Eye Pilot Plugin removes red eyes from your photos directly within Adobe Photoshop or Corel Photo Paint. You can adjust the pupil area and brightness, and preview the results real-time. The program keeps structure of the pupil.